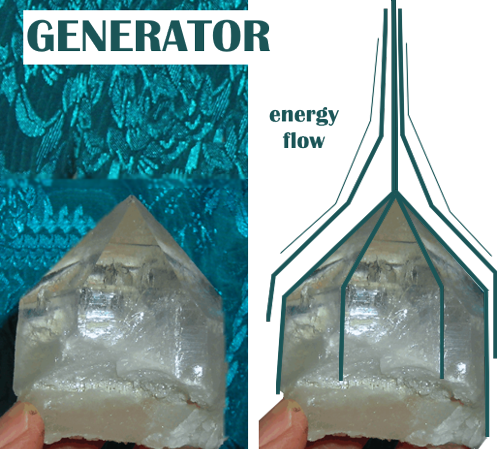 Crystal Genn » CRYSTAL HOW-TO » How is the Energy from Generator Crystals Different? Generator crystals have six equally sized faces and a centrally located tip. It is very unusual to find such a precise configuration in nature. You may find a point with the energetic qualities of a Generator, but the physical description may not be textbook perfect. For example, if the tip is centrally located but all the faces are not equally sized and/or each doesn’t reach the tip (more on this below). Does it matter if the crystal is “perfect” according to a textbook description? What if it is cut and polished into that shape? We discussed in an earlier blog post that crystals are commonly polished into Generator points. Remember that in these polished Generators, you might find that the energy might not feel as focused as a naturally occurring Generator. This is because the internal structure is different than the outer structure. See the previous blog post for a more full description of why this is true. 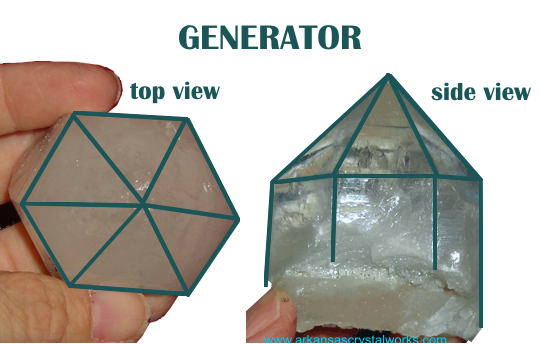 WHAT IS THE ENERGY LIKE IN GENERATOR CRYSTALS? I see the energy of Generator crystals like a blowtorch versus a candle. Both a blowtorch and a candle have a flame, both are warm and can burn, but one is WAY more directional and powerful. Even if you had a very large candle, the energy of a small blowtorch is still much more precise and directional than that of a large candle. The candle flame wavers and flickers, grows and recedes – glows – the light (energy) is less focused, more diffuse and softer. With the blowtorch, on the other hand, you can cut right through a metal plate like a hot knife through butter. Don’t get me wrong, a candle and a blowtorch can both start a fire that will burn down the house. Neither is better than the other. We’re talking about the difference in focus and intensity. HOW MIGHT ONE WORK WITH GENERATOR CRYSTALS? The original question was about using a Generator to charge other crystals. Yes! But with a caveat. I don’t recommend using Generator crystals as chargers to set them with your other crystals to generally energize them. I would see them more like magic wands. Let me explain. Stepping back to visualize a blowtorch again; if you wanted to warm up, or illuminate, a bunch of crystals, you might use your large candle, and set your others around it for the warm glow. On the other hand, if you wanted to super heat (super charge) your crystals, you might hold the blowtorch (Generator) and aim it at them (with the intent of charging). There is a difference in leaving your crystals alone to charge with another (say selenite for angelic energy or a cluster to increase vibration). That kind of energy glows into them, raising them, charging them. They all lay and bask together like baking in a warm oven. The generator, on the other hand, would be for power charging. You would hold and direct the blast. (Visualize a blowtorch on top of a crème brulet) PSSSHHHH BAM !!!! As for a Generator crystal in the center of a grid, absolutely! For example, in a grid for healing, you might select Self Healed or Golden Healers for the periphery. With a Generator crystal situated upright as the central anchor crystal, this healing energy is gathered and projected outward powerfully. Beautiful! WHEN DO GENERATOR CRYSTALS HAVE TO BE “PERFECT”? In my estimation, the only time you HAVE to have a textbook perfect Generator is if you have a collection of crystal configurations and you want a “perfect” specimen of a Generator crystal. If you are looking for a Generator crystal for the energy it has or the work it may help you with, a close approximation should be just fine. However, if you are the type of person who requires unrelenting perfection, and anything less makes your eyelid twitch, this may not prove to be true for you. What if a person had a choice between selecting a “perfect”, cut and polished Generator crystal versus a natural, not-quite-textbook Generator crystal? Personally, I would always pick a non-textbook natural point Generator crystal over a textbook perfect cut and polished Generator crystal. Why? The internal structure would more naturally flow out of the tip or point of a natural termination than a termination that has been cut and polished into that shape. DO GENERATOR CRYSTALS HAVE TO BE TEXTBOOK PERFECT SPECIMENS TO WORK? 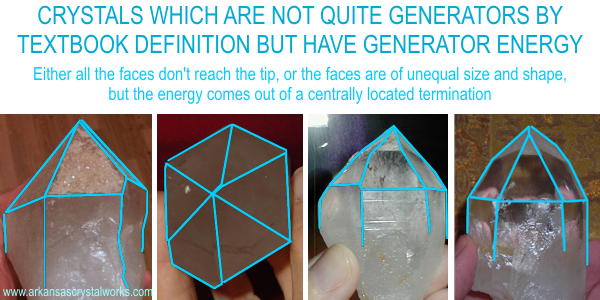 Lots of people ask me if a Generator crystal has to be textbook perfect to have the same power (will they still work if the faces are a little “off”)? To tell you the truth, I don’t think the fact that a face is dropped a little below (which would mean it was a different size than the other faces) is that big a deal in my opinion. If they are all centrally located and all the faces come to a centrally located point, they would give you plenty of OOMPH. There are some examples of not-textbook perfect Generators in the picture above. The points (terminations) are all centrally located, but some of the faces are different sizes. On a few of the crystals, there is a facet or two that doesn’t reach the very tip of the point (pictures 2 and 4). I would call all of these “non-textbook Generator crystals”. What I understand from my crystal guide, Venus, when I posed this question to her is this: naming crystals is a human endeavor. The Crystal People don’t separate themselves into categories or named groups. They simply ARE. However, naming crystal configurations has served a purpose. By naming the different types of crystals, and giving these names functional definitions, we are all on the same page when looking for a certain configuration. Example: I am looking for a crystal that has a centrally located point with faces that are all the same size. I need it to direct energy in a precise and powerful fashion. Because of our naming system, I know to ask for a Generator. Names serve as a sort of shorthand. But for function, a Dow or a Laser wand would have the same precise energy direction that you would get with a Generator. The name plus the description help to narrow down the search even more. Don’t get tripped up by our human-made names and definitions. A crystal that is not quite a textbook perfect Generator still has the same energetic power as a textbook perfect point. So some of the faces don’t meet at the center, top, or aren’t all identical. In our 3D reality, we judge it to be “less than” because it doesn’t fit into our preconceived definition. This isn’t a fair assessment. Choose your Generator crystal for its intended function. Do you require a “perfect” specimen for a collection? Or are you simply looking for the energy of a Generator with which to work? Will the fact that your Generator crystal is not “perfect” impede your ability to work with it? The most important consideration is how a specific crystal resonates with you, personally. If you like it, and feel an affinity, the fact that it is (or is not) “textbook perfect” should be the last consideration. If you were looking for an answer to whether or not you must have textbook perfect Generator crystals, I hope this post has helped you! As always, I look forward to your thoughts, input and comments. Tagged choosing your crystal, how to. Bookmark the permalink.